Discussion in 'News' started by Spalw, May 4, 2018. Last year we had a bundle available for the first few days of the new map to support our costs from the period of downtime between the maps. During this time our costs are abnormally high due to the amount of development work that we employ for a map release and our donations are down due to the lower player count. 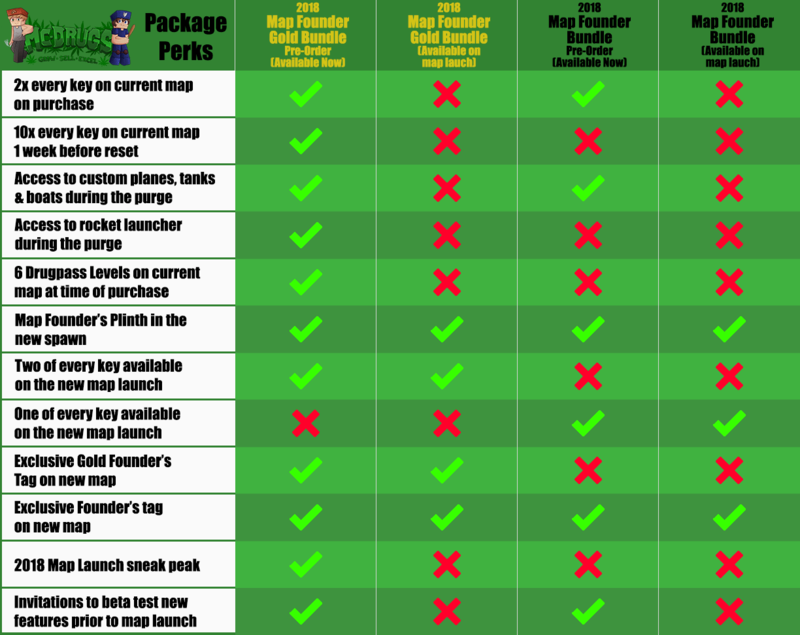 This year there has been a map founder's bundle available for the past few weeks to Pre-Order. Pre-ordering the bundles gives you a few cool perks for the current map and some very unique abilities during the Purge. Along with one of your only opportunities to have your npc a part of the new spawn for the entire map, and beyond. Information about what's exactly in the bundles can be found below. These will only be available to buy for a few days after the map reset. The pre-orders are open now and you will still get all of the perks up until the cut-off dates. Thank you for your ongoing support, and to those who have already picked up a bundle. The keys for gold bundles will be distributed tomorrow, the sneak peak for the spawn will be held on Thursday May 10th just after DP time. Buying any of the bundles will also entitle you to the Founder's Icon on Teamspeak and a new founders tag on the website!